Haitian Senator Rony Celestin says the root the contraband problem at the Haiti-Dominican borders in the Centre Department of Haiti lies within the rich businessmen in Port-au-Prince making huge profits from it while it's the poor people of the Plateau Central who are the target. According to Senator Rony Celestin, certain members of the bourgeoisie are making millions in profit from contraband with the complicity of Customs directors, crooked police and crooked customs agents but it's the little guy trying to survive who gets in trouble. "If the Executive branch of government is willing, it can resolve it," Senator Rony Celestin said in an interview to Haitian radio SCOOP FM Tuesday. "Nèg potoprens vinn explwate fontye yo, epi yo bay neg plato santral pote chaj la"
The rich businesmem from Port-au-Prince are exploiting the borders in the Centre department and the poor folks in the department are falling victim. "How many people from the Plateau Central have big businesses in Port-au-Prince? "Everyone knows this, when all the trailers of rebar (fer forgé) are passing through the border illegally, when all these sealed containers are passing through the border, they are all taken to Port-au-Prince to be stored in big warehouses." "Compare that to a poor person from the Plateau Central who buys some cement to resell to make a few hundred dollars to pay for his children's education, he is the one being accused of contraband while the man who is supposed to be paying 700,000 gourdes in import taxes on merchandise and only pays 100 gourdes, he is not doing contraband? because he has a big name?" "It is time for these evil people to stop acting like they are the smart ones, playing on the personality of the poor while they know what they are doing is illegal." "The Customs directors, are they not the 'restavecs' of these people?" "The ministry of Finance, is it not the 'restavecs' of these people?" "Why don't they take control of the situation and make them pay proper taxes?" "Today, were are focusing on the small time person who tries to go though the border with 300 cement bags and we forget about the big guys who bring boatloads of whiskey to Haiti saying it's paper, or the guy who is importing boat loads non biodegradable foam packaging materials to the country illegally." The people of Haiti need to know what the Bourgoisie is doing and we have set a standard in everything happening in this country. Senator Rony Celestin says it is always to good to address the problems but it needs to addressed properly. "The problem is not in Belladere," he said, "it comes straight out of bourgeoisie in Port-au-Prince." 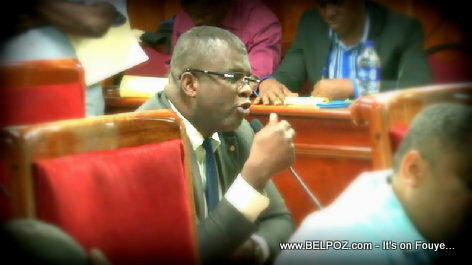 Le sénateur Rony Celestin affirme que le problème de la contrebande aux frontières haïtiano-dominicaine du département du Centre réside parmi les riches hommes d'affaires de Port-au-Prince qui en tirent d'énormes profits tandis que les pauvres du Plateau Central sont les cible. Selon le sénateur Rony Celestin, certains membres de la bourgeoisie tirent des profits de la contrebande avec la complicité des directeurs des douanes, de la police malhonnête et des douaniers corrompus, mais c'est le petit gars qui tente de survivre et qui a des problèmes.